Well lately I've been upbeat and happy -- and the weather is a cherry on top -- but there is one little caniving thing gettin in my way...ED. I find peace and then he has to come around and ruin it. Last night I couldnt' sleep very well because my mind was full of endless thought about recovery. Recovery is a wonderful term, it means so much, but the predominant meaning is to get my life back...to start living up to my full potential again. However, that doesn't go without the struggle of one thing -- weight gain. Just the thought gives me so much anxiety. I got to this point from deeper problems inside of me, food is just the thing that got manipulated to cope with those problems. Those issues have an abundance and variety, but one that stands out in my mind is body image -- the way I see myself. Before all this happened I was really good at fooling everyone around me, I seemed happy on the outside, but on the inside it was a different story. I remember looking in the mirror criticizing my body, being disgusted and ashamed at what I saw. No one knew that I felt this way, and as I hit rock bottom, ED came into action. At first I just thought I'd be happy with losing just a little weight...and then once I figured out how easily I could lose weight from eating very little and working out every single day, it became a high. The numbers got lower and lower and the feeling of control over that part of my life was empowering. I couldn't control everything else in my life, but I could control my body, and that made me feel safe. So now I'm at a crossroads, I finally want to get better and live my life, but the thought of going back to that girl -- nit-picking and judging her body -- scares the daylights out of me. I want to love myself and my body, and right now I like the way I look, despite what anyone else might think. And I know looks are not everything and its whats on the inside that counts, but is it bad that I want to like the way I look and be confident in myself? I feel like I'm all talk and no action, I want to make the leap but am really scared that I'll just end up falling. Sorry to be a debbie downer but I just had to get that out. Is anyone having the same feelings/thoughts? If you are I'd love to hear them. I'll post later because I have some news to share! this completely symbolizes how I felt. Completely having the same thoughts. I'll tell you right now, I've been in recovery for over a year - yet I don't feel like I'm recovering. I eat in front of people, but I compensate for it later by not eating when I'm alone - just to avoid weight gain. 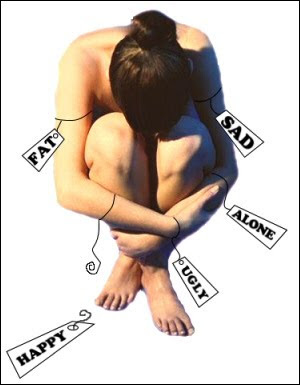 When my recovery first started, I actually became Bulimic. I managed to veer away from that, but Anorexia still plagues me everyday. You do feel quite alone. Especially when you have so many thoughts running through your mind - thoughts that produce panic attacks and anxiety. I found that, sometimes, the best way to calm myself down, was to listen to music, and hug a doll or teddy bear. It made me feel more secure, and stopped the thoughts about weight gain from flooding my brain. sweetheart the mental aspects of recovery are have the battle - and it sounds like your coping well and are extremely motivated to get your life back.. However, as you know - the weight gain is an extremely crucial part of recovery as well.. and i know that anxieties it caused -- in my beginning stages i was so apprehension. But, as i started my journey i saw how slow and progressive the process is - the weight doesn't just come on all at once.. your body transforms slowly.. it gets stronger..it begins to look HEALTHY. all of these things that ED tells us should be "scary" you'll learn to see are truly beautiful! embrace the changes girl - i guarantee.. you WILL learn to become comfortable in your own skin. Like anything it takes work and challenging yourself - but it's so worth it in the end! Okay, so this is probably my third comment on your blog and I'm sorry if I'm being annoying. But oh my god Emily, even though I have a completley different disorder than you, the feelings are the same. I used to critisize myself in front of the mirror and became my own worst enemy. I knew I needed to lose weight, and I started off by doing it a healthy way. I was doing awesome. But as time progressed, the diet I was on became my only friend. When I would allow myself and other food, I would purge. And the best part was.. I didn't gain weight. It was empowering. I stopped my diet program, and began eating "normal" again. At least, that's what everybody saw. In secret, I was controlling everything I ate like it was my job. It was all i could do. Everything else and everyone else could change, but my eating habits were consistent, and I liked that. But then I began to lose myself, my friends, and all of my imagination and creativity. I'm trying to regain everthing I lost in my freshman year.. Thank you SO MUCH for this post. It's so good to know that I'm not the only one fighting this. I would like to thank you for posting this Emily! I will be turning fifteen this year.. and I feel like every waking moment is spent worrying about my body.. when really I should spend my teen years not caring. But its so hard when your family is fit as a riddle... and your not. thats just my thoughts. But I get what you mean.